Hi Stampers! DeeDee here again, today. 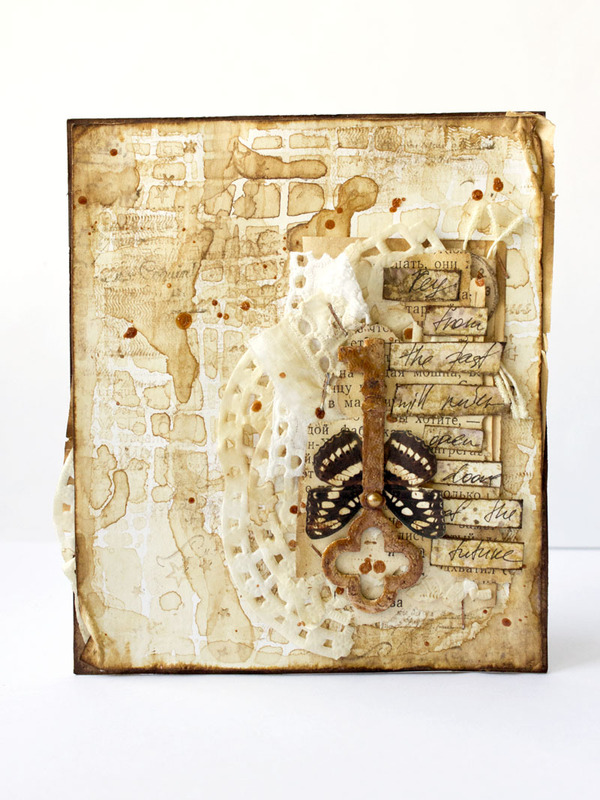 This time sharing a project of my own, using a splattering of old and new stamps! 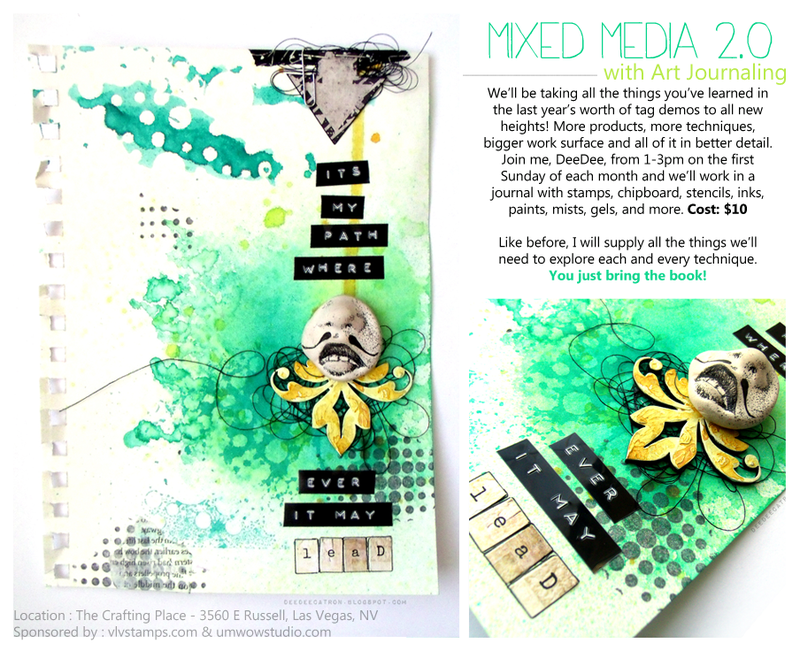 Did you see this post on Saturday talking about the new Art Journaling classes we're doing? Well I've been wanting to really fill up my new journal with all types of pages.. and so today I have a double spread to share, that really is just sort of all my favorite techniques and styles. 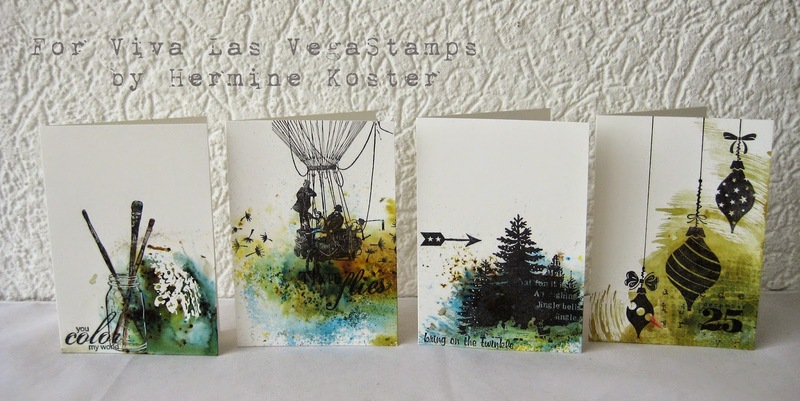 The page base is a sheet of Nature Walk from 7 Dots Studio, with layers of stamping and gesso, coffee, distress ink and more. Up in the top right corner I stamped the Cracked Background in Memento gray flannel. I have tons of ink pads in different colors, but it's tough for me to break out of stamping black. I found this gray was a nice subtle alternative, without losing interest in the rubber stamped image. 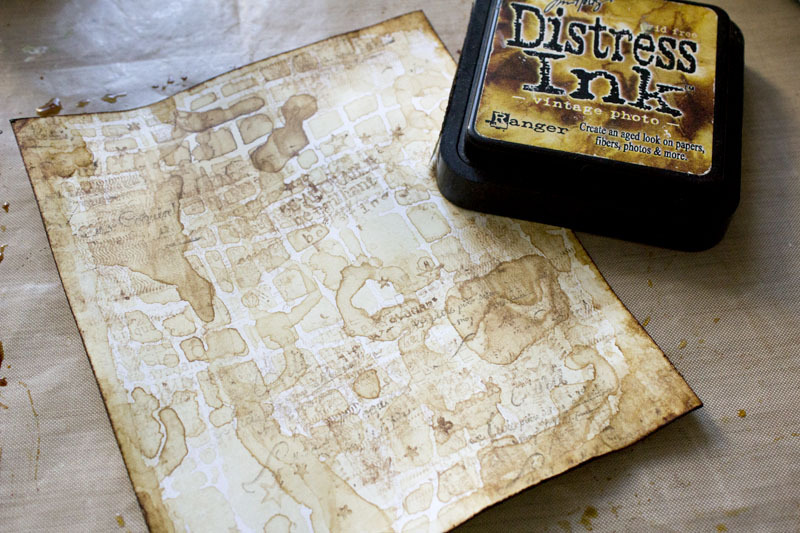 You can also see, in the very corner, where I stamped the Writing Background in archival ink. At this point I did find it to be a bit heavy for the vintage feel of the page, and so I covered it up a bit with gesso, just letting the stamp peek through. Below this tag you can see some more stamping in gray, this time the Color Wheel Lines. Notice in the top left corner... that's the brand new Waybill / Invoice background. 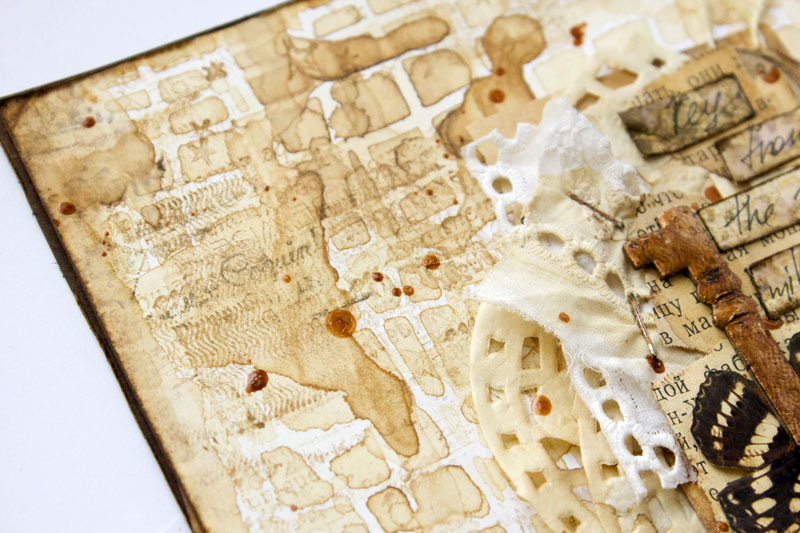 It's been stamped in Versafine Toffee and whitewashed with a thin layer of gesso. 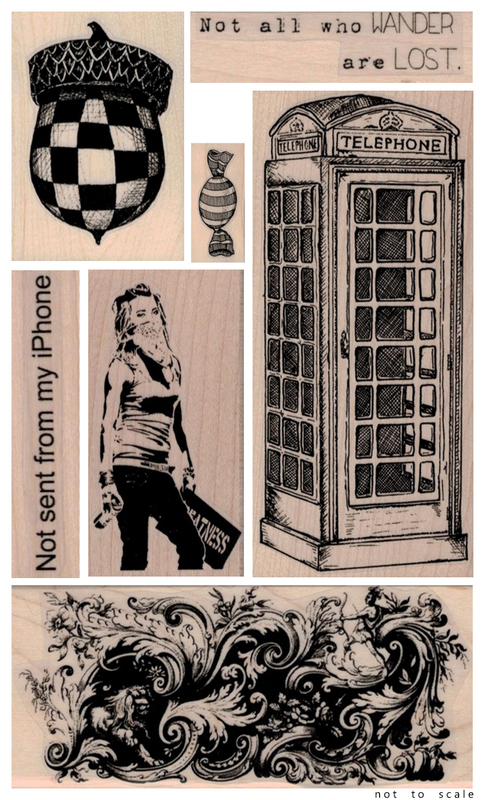 It helps lighten the stamped image allowing it to blend in a bit to the background. Handy when you don't have a lighter colored ink pad. On the left hand corner is the new Butterfly Specimens stamp in a nice heavy black Archival ink. It helps balance out the spread. And one last final photo here.. I snuck in the 23.24.25 tape measure stamp from Plate1430. It's been stamped in that same gray used earlier in the page. There's tons of media mixing going on here, including ink types (Archival by Ranger, Memento, Versafine,) mists (Tattered Angels mixed with coffee,) coffee stain (Which I totally picked up from this post by Natasha, SO COOL,) gesso, patterned paper (7 Dots Studio,) Golden Gel Medium, Tim Holtz tissue tape, Prima flowers, My Minds Eye brads, UmWowStudio chipboard, 7 Dots Studio and Sizzix die cuts, and more. Hi stampers :) DeeDee here today bringing you a few fun things I've seen around the web lately! 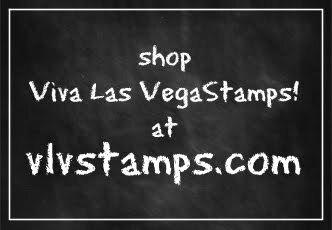 Don't be afraid to post on our FB wall, in our FB group, tag us on Instagram (@vivalasvegastamps) and more. We're always on the lookout to share fun bits by fans from all over. 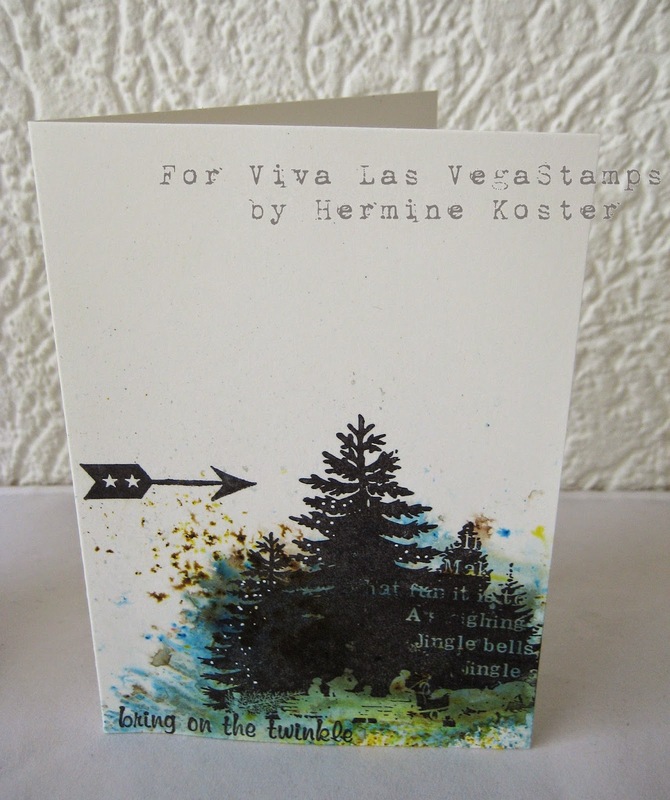 First up is this superb card using the Walking Turkey stamp by Alie Hoogenboezem-de Vries. 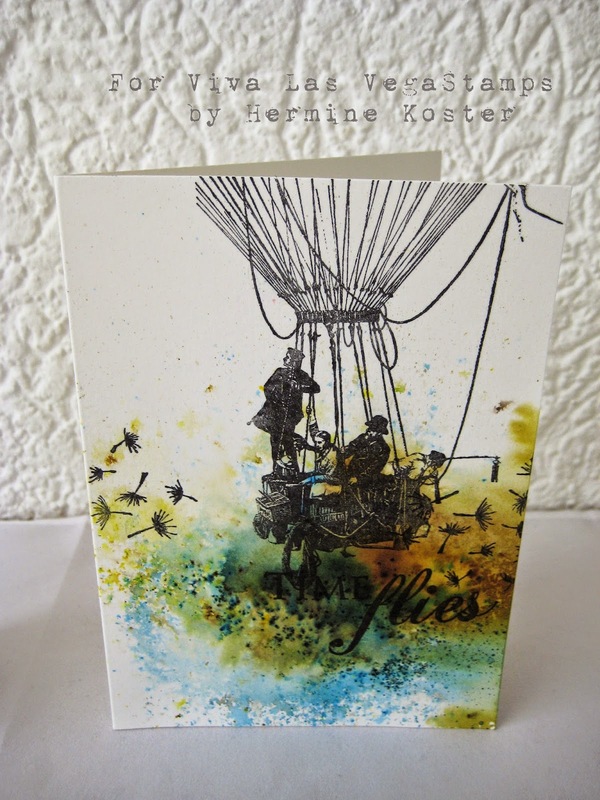 Second is another card, this one by Georgia Heald using our Steampunk Fawn stamp. 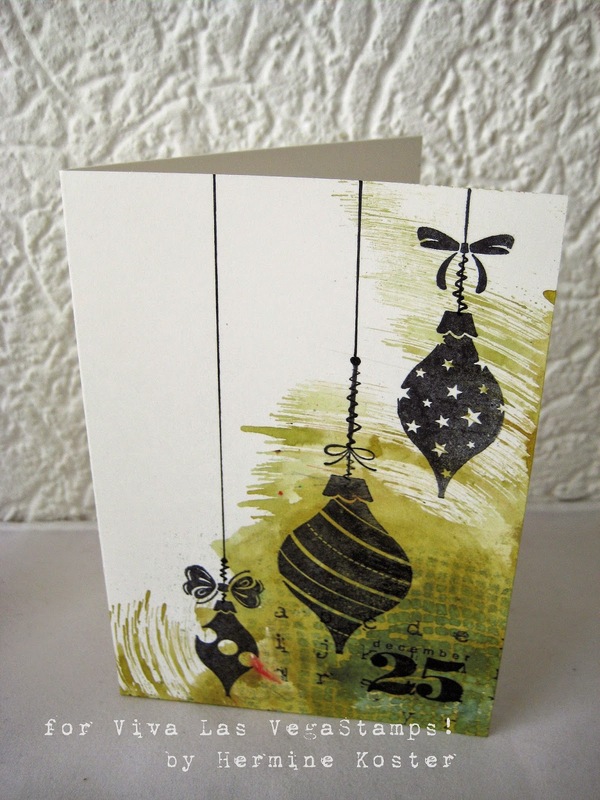 And last (another card) is this bit by a local gal - Paula Cook! She's used our Pinup Girl with Martini. Good stuff to share today :) Leave these super fans some love! Hello stampers! It's Amy here today share a card I've made, with lots of springy bright colors. I'm happy when I see it, and that's a good thing. I started my project by layering on two haphazardly cut squares of pretty patterned paper. 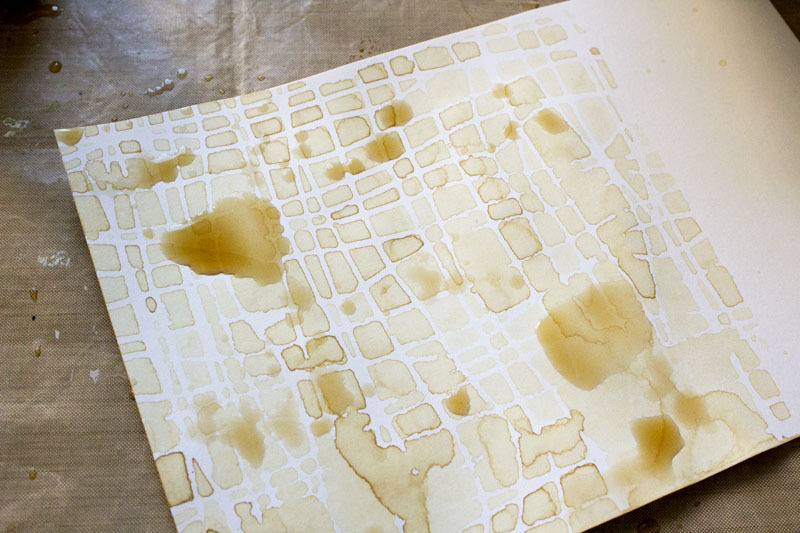 I inked the edges of one paper, using walnut ink, and both edges were inked with Archival Ink in coffee. These were adhered with Miracle Tape. I tapped on a little bit of green mist, and then stamped the Arrow 3/4x1 1/2,and Chevrons 1x1 1/2, directly onto the paper, using pink and silver inks. 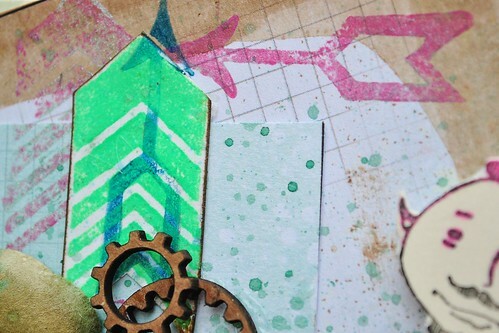 I stamped with green ink and the chevron stamp onto a separate paper,and fussy cut this out, inked the edges, and adhered with miracle tape. 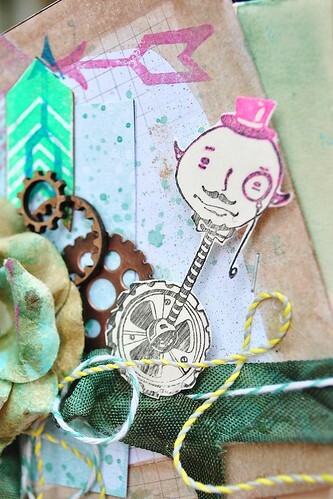 The final bit of the layers of stamping was to stamp the color wheel lines stamp in the bottom corner, and the wheel from the Wheeley Monocle Face slightly off the page. I dyed my own seam binding ribbon with the green and brown walnut inks, dried it, and adhered it using miracle tape on the back. To the tied ribbon I added some baker's twine for extra pizzaz. ;) I sprayed the Prima flower with mists, adhered, and added the chipboard and metal pieces. Finally,I colored on the wheeley monocle face stamp with a Faber-Castell Big Brush Pen in black, and then swiped on some radiant neon ink in electric pink....to give some va-va-voom to his hat, eyes, and monocle, and stamped that baby onto some heavy cardstock. I fussy cut him out, and popped him onto the paper, using foam dots. And voila! 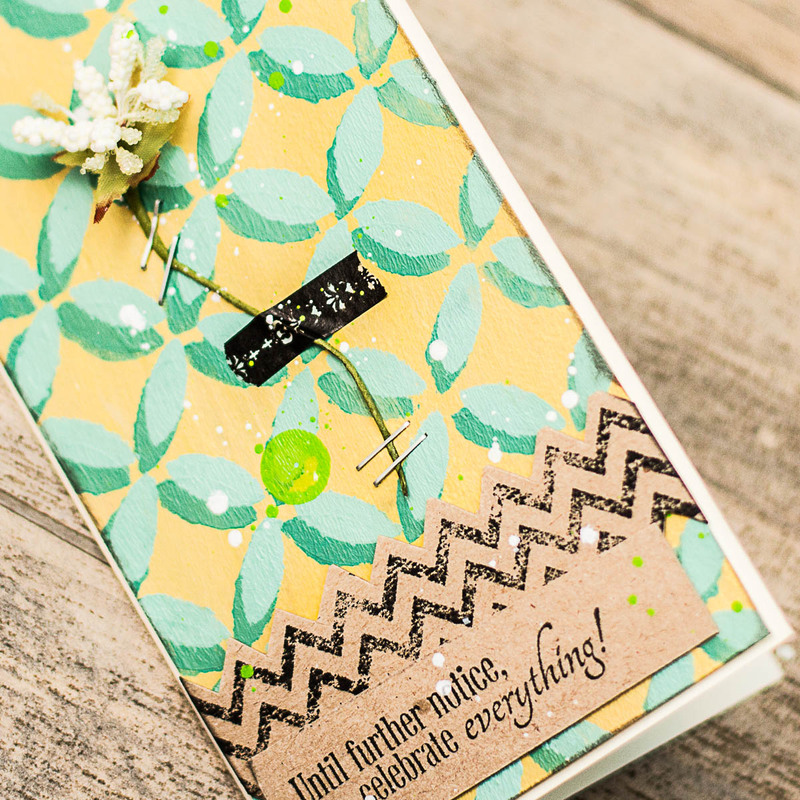 A fun, springy, and special card to pop into the mail for a friend! Pen: Faber-Castell Design Memory Craft, Big Brush Pen in Black. Last year for the first Sunday of every month from 1-3 pm I hosted a tag demo/make n take/class @ The Crafting Place here in Las Vegas. 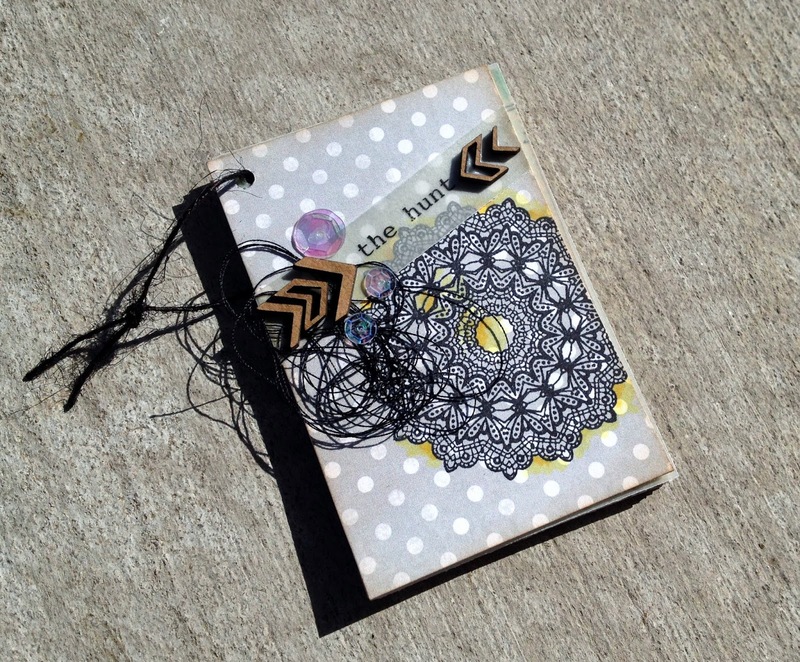 This year I've upped the ante and we'll be doing some art journaling! Bring yourself, a book, and $10. We'll be exploring LOTS of goods. 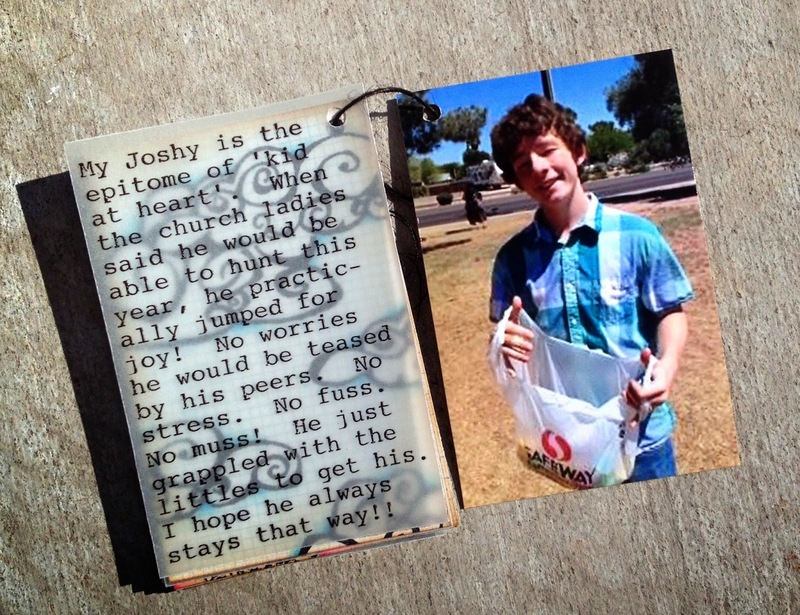 We'll be meeting @ The Crafting Place : 3560 E Russel here in Las Vegas. Down by the airport, right after Pecos. 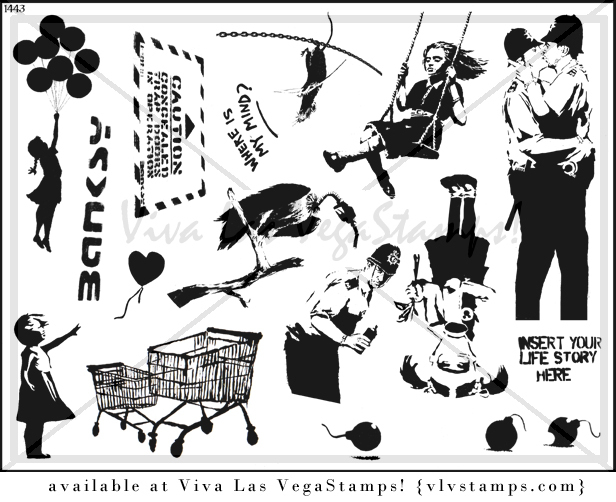 The class is sponsored by UmWowStudio & Viva Las VegaStamps! 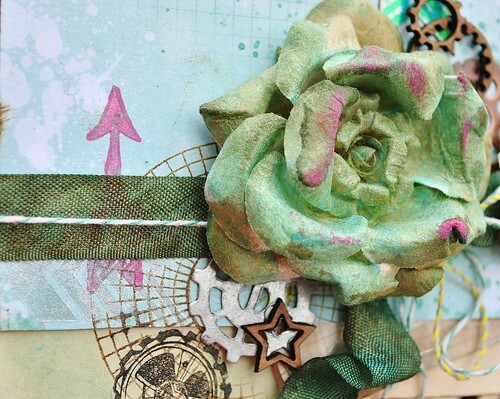 - we'll be doing lots of stamping, chipboard altering, mask using and more. 2) You should also bring (if possible) a non-stick craft mat, a heat tool, acrylic blocks, scissors, any of your favorite pens and an archival ink pad. 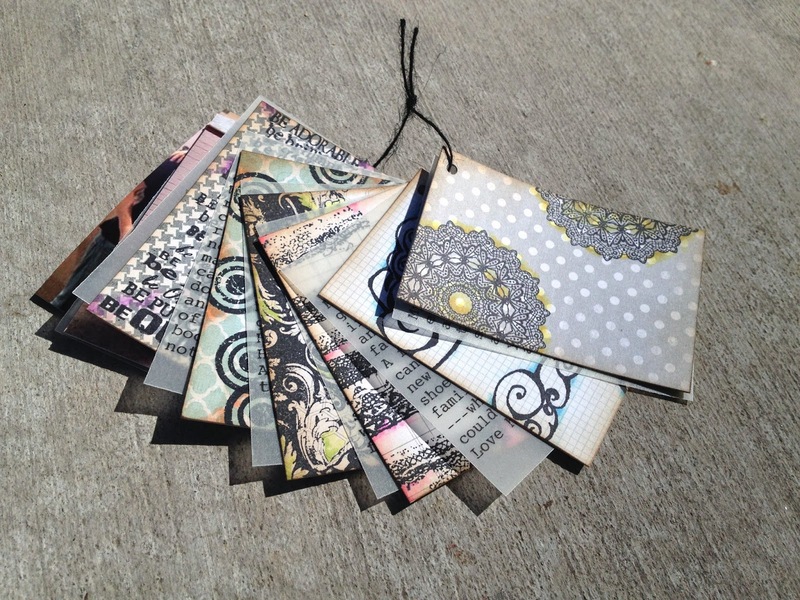 3) It will be $10 per class; and you’ll always leave with SOMEthing; a stamp, some chipboard etc. I’m excited to get to explore some of the more expensive materials; I still love being thrifty but this will give us a chance to really delve deep into all sorts of goodness! And we’ll be doing it on a bit larger scale, which will prove better for learning each technique. See you there! Paint, ink, two stamps, one flower... and... the card is ready! It's mellpellmell (Maria Potapovich) here today with you! You know, creating cards for me for some reason is very difficult task. I do not want to make cards with kilos of flowers and rhinestones ... but everyone usually do so! This time I've made it tricky - I've used the flower, just one. And except it on my card there are only two embellishments - both are made by using stamps (wide strip with chevron and uneven quadrangle with text )! Hope you like simple cards...are you? I gotta wear shades! Ok are you all singing Corey Hart along with me now?? haha One of my fave stamps is the Lid lady, isn't she simply fabulous??? I love her big shades, leopard print scarf and that big garbage can lid as her hat! haha Since I am one who always wears big shades as well (they are prescription) I did a layout using the lid lady and a bunch of pictures of me in my shades. I added some rhinestones to the lid lady's hat to decorate it up. I love her!! Then I cut her out and found some papers I wanted to use and put a sticker down the side of one side. Then I added a quote that I printed off from the computer and used stickles to glitter up her lid! and here I made one card without using a black marker to color in her sunglasses and dress and one where I made the sunglasses and dress darker. I think I like the darker what do you think? 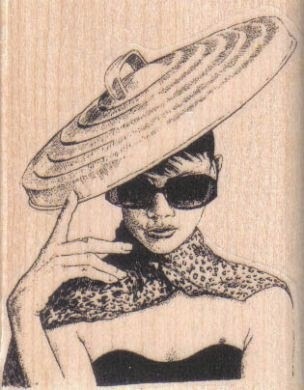 and voila, here is the lid lady on an ATC! I added a little blue bow this time to her lid, isn't it cute? We've got some fun things going on! Did you know? We have a newsletter, where you can get all updates and info delivered right to your email! Sign up and be informed. We'll let you know about sales, coupons, new stamps, giveaways, preorders and more. 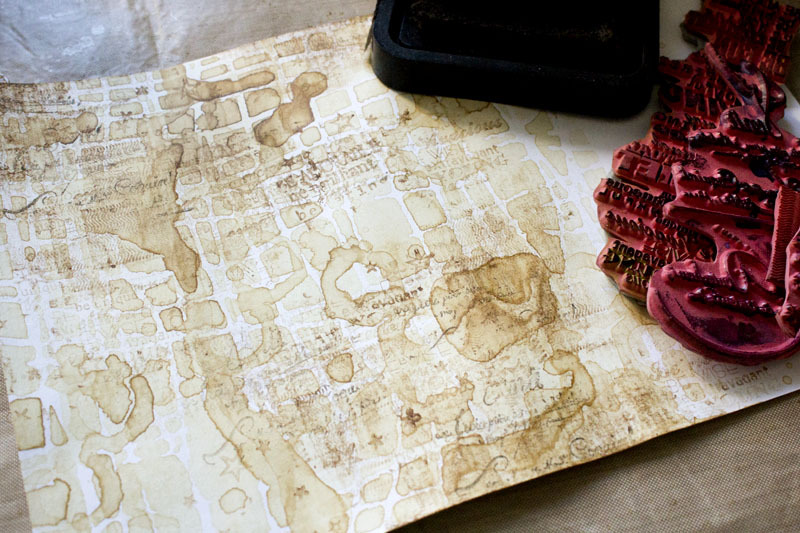 Our newsletter also mentions a PreOrder Plate O' Rubber. By Popular Demand we've released Plate 1443 dedicated solely to Banksy spray paint images! Pick it up for the 20% off price of $17.56. Combine it with our free shipping coupon -- what a deal! 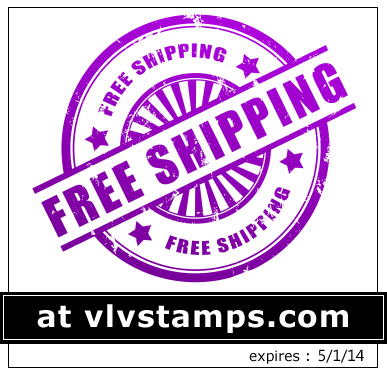 Use coupon code "freeshipping" to receive free shipping on any order, international included! (Click My Cart at the top of the page, enter code in the Discount Codes section of your cart and hit apply.) Expires Thursday 5/1/14. So >>> Get some shopping done won't ya?? Hello!! Mary here with a pocket-sized book for lookin'. Last weekend, I was able to capture a few snapshots of my kiddos at my church's annual Easter egg hunt. From the moment I took them, I knew I wanted to scrap them...and FAST! I've been on a mission to use up some of my old paper stash. While it's a noble endeavor, playing with older paper can be a bit blah. I find myself craving the new. It's exciting to get your hands on craftin' goodies---hot off the press!! So, I thought what better way to jazz up old paper and make it new again, that with some rock solid stamping?? 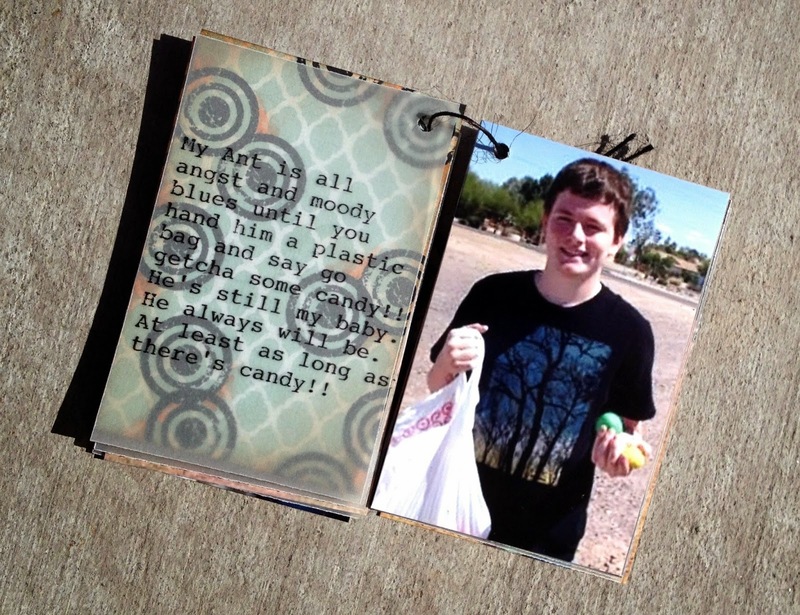 I started my book by cutting my photos and papers down to 3x2 inches in size. For each patterned paper, I chose a stamp and stamped (sometimes repeatedly, depending on the size of the stamp) my image down with Memento ink in Tuxedo Black. A bit of color added really makes the stamped image POP!! I've used my Copic markers in a variety of colors. 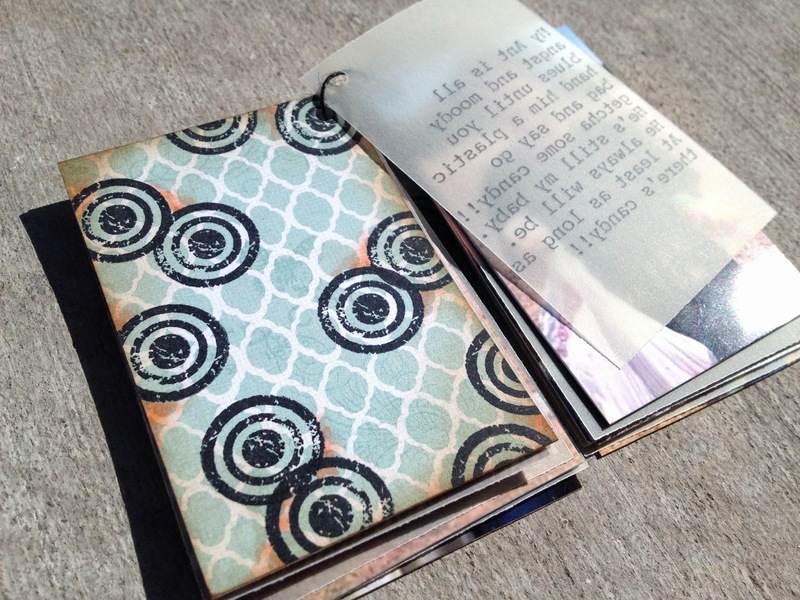 Being such a tiny book, I decided to add my journaling on vellum. It gives me plenty of room for the story without covering up any of the lovely stamping. I LOVE how this bulls eye page turned out! 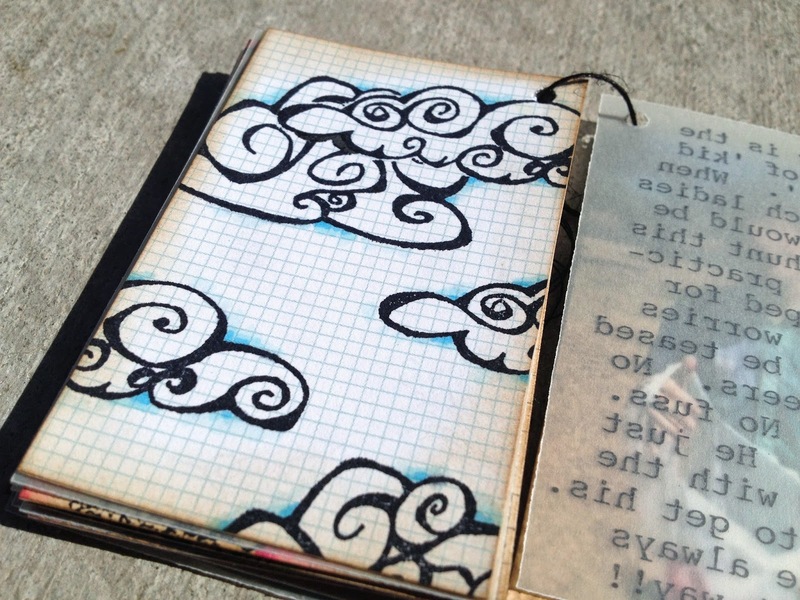 And this clouds page is super whimsical and totally makes me smile. And that's my book!! I love that it's pocket-sized but still packs a punch. Hi Hermine here. I deciced to make a series of cards using Bistre. Bistre is a powedry substance with lots of pigment and deluted with water it releases its colour. The colours are a bit grungy looking and I really love that. Here is the whole series in one view. step 1: Put some Bistre in a spray bottle and add some water. Then spray a little bit on a craftsheet with several colours (I used three). step 4: use the deluted Bistre as a water colour and give some colour to the brushes. Make some white Highlights with s white sharpie pen. step 1: Spray the bottom half of your card with water. Then sprinkle some Bistre in it. Heatset until fully drr. step 1: Do the same as with the balloon. step 3: make some high lights in the tree with a white Sharpie pen. step 1: Spray some deluted Bistre on a craftsheet and put your card in and turn it 90 degrees. Heatset to completely dry then take a stencil and spray on the right bottom hlaf. And yes the last 2 are Christmas cards hahaha, because there is no such thing as start to early, at least for me it is. Every year I promisse myself to start in the first half of the year and then discover in november that I didn't do so, it will defenitely takes out the stress of the holiday season. Hopefully it will inspire you. 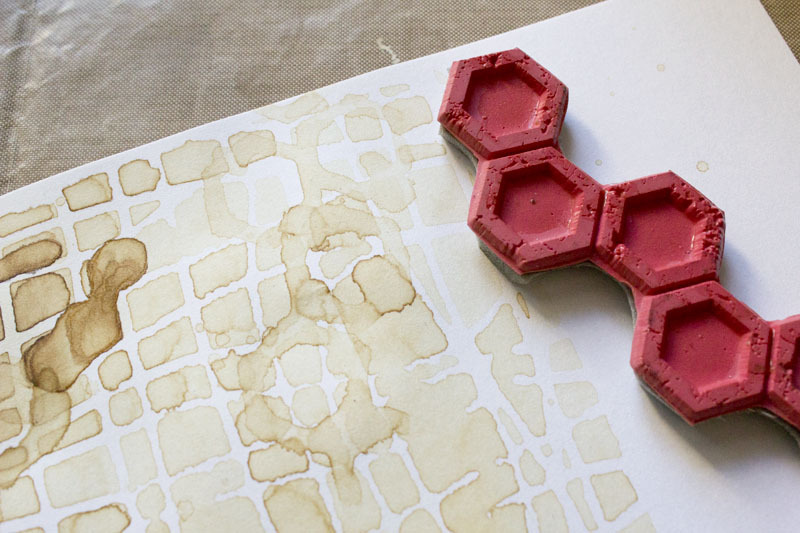 Have fun playing and stamping around. 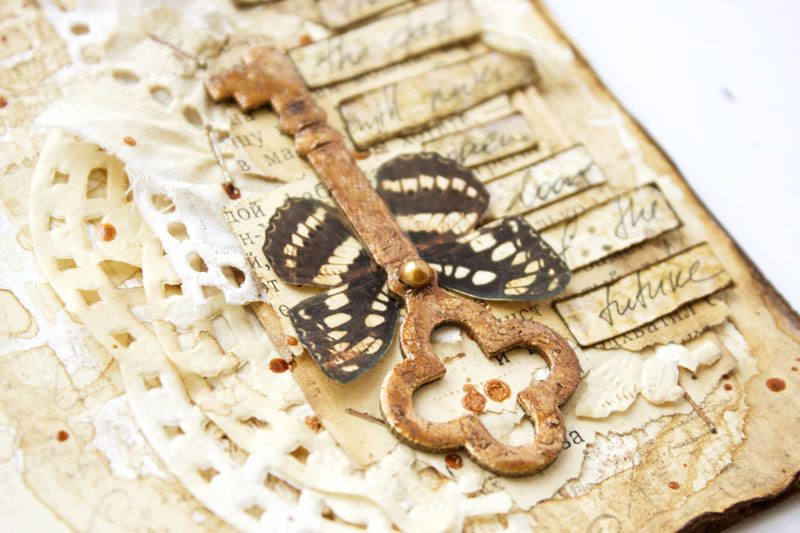 I very love to use hot embossing on the chipboard. Tina here again today and I am excited to be able to share another project with y’all. 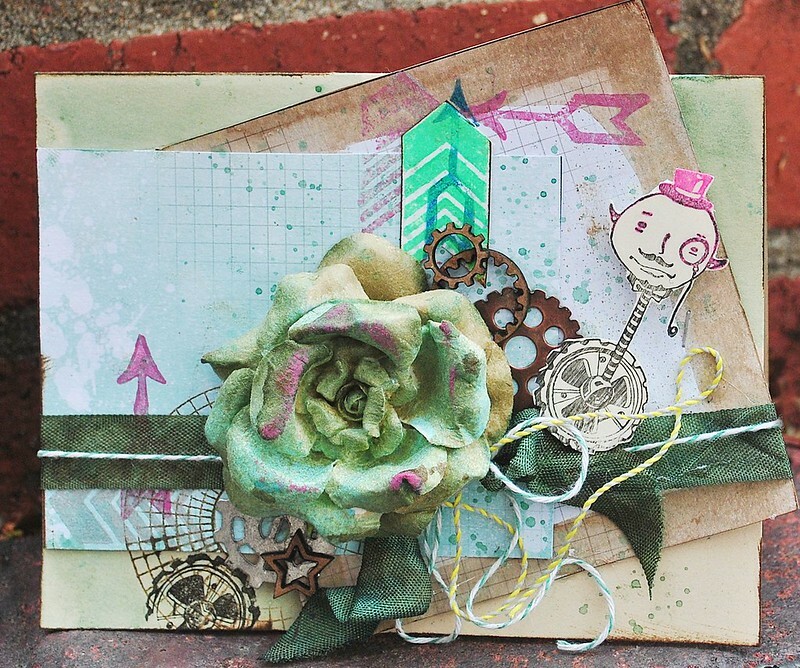 Today, I would like to share Love envelopes, using 'Bird Head', 'Steampunk Owl', 'Face Collage' and 'Color Wheel Lines'. To create my envelopes, I started by heat embossing several stamp images to small tags. 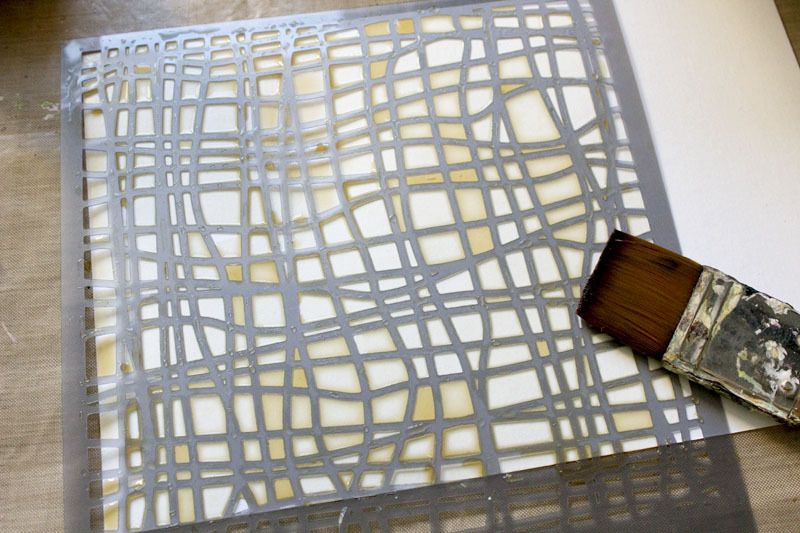 I used a white/gold embossing powder so that it would act as a resist when applying paint. Using several complimentary colors, I painted each tag and wiped off the paint from the stamped image (with a baby wipe). 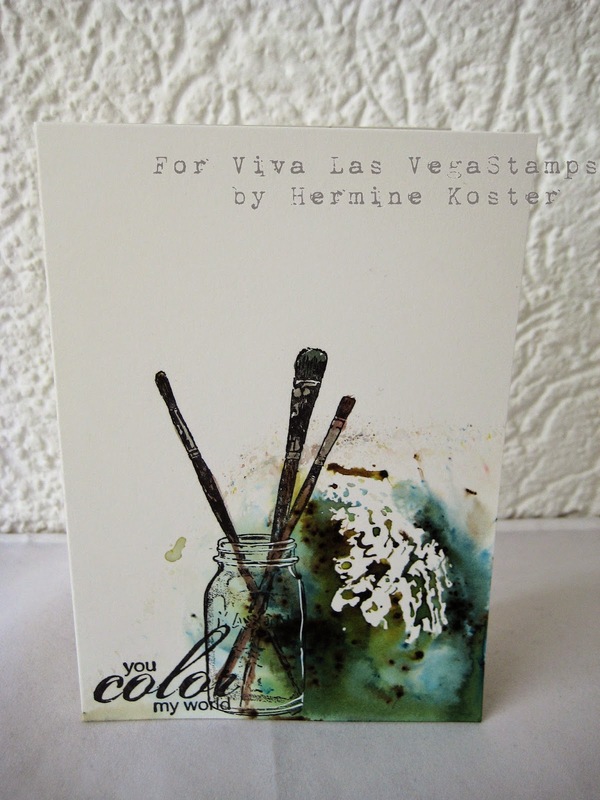 I then stamped a white coin envelope with 'Color Wheel Lines' stamp and colored in (randomly) the pattern. I then stapled the stamped tag to the stamped envelope. To finish my Love Envelopes, I dry embossed several larger envelopes, then attached a rhinestone brad, tag, stick-pin, and sentiment to each envelope. 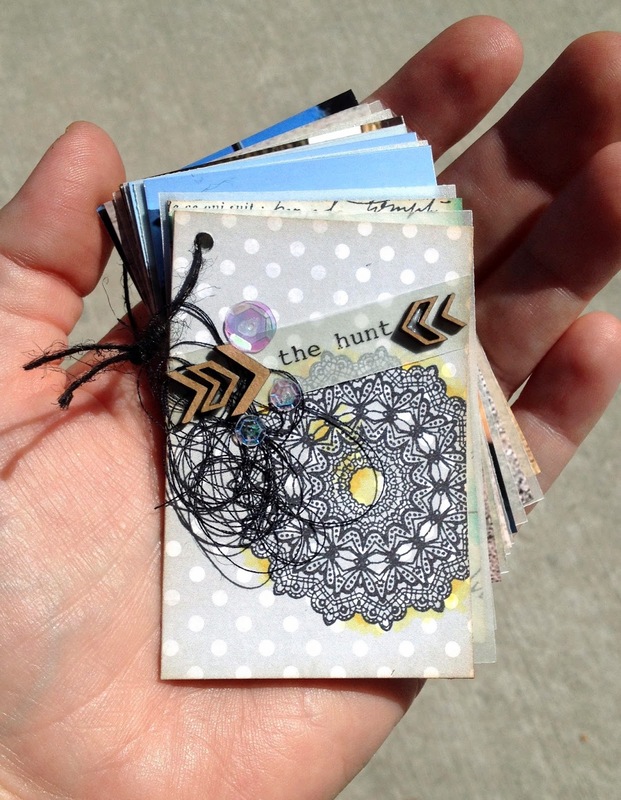 This is one of those ‘done in a minute’ projects, that I just love.